Haunted House – Krafty Peeks Day 1! We’ve got a new background stamp set to share with you today! 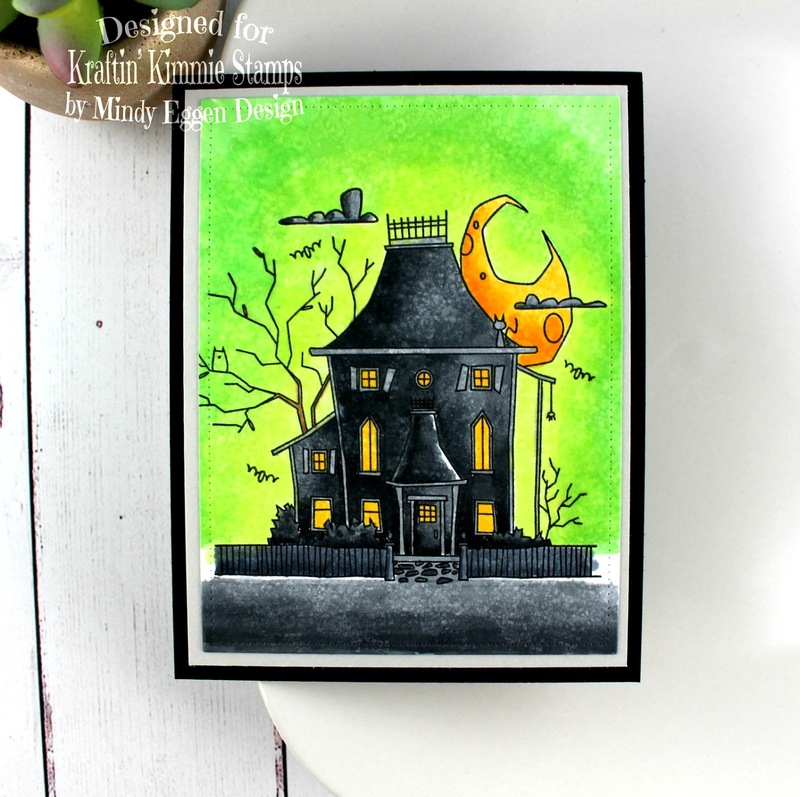 This super creepy set is from artist Emilie Goulet and it’s our new HAUNTED HOUSE! 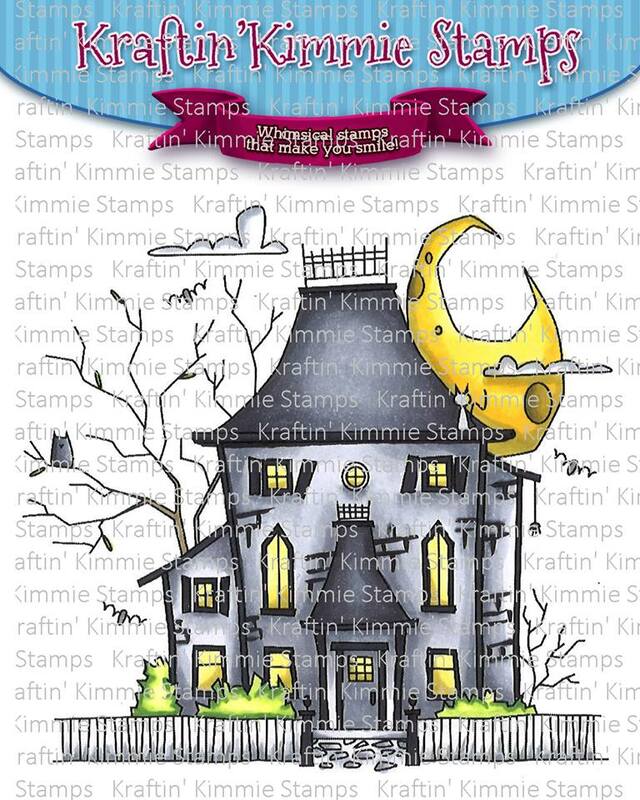 This fabulous image was included in our Halloween Krafty Kit along with THREE BRAND NEW Krafty Kolours Hybrid Inks!!! The set features one large main image that is almost 4″x4″ in size! 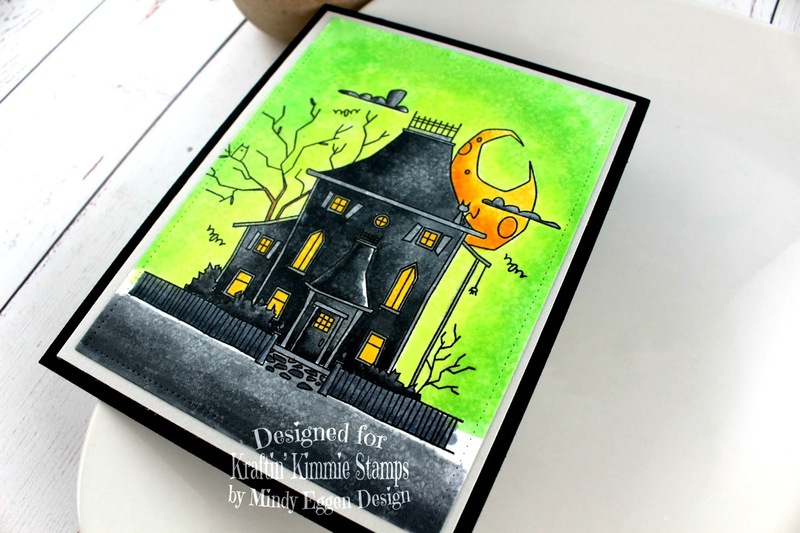 It can be used as the focal point of your creation or in combination with lots of other spooktacular stamps! 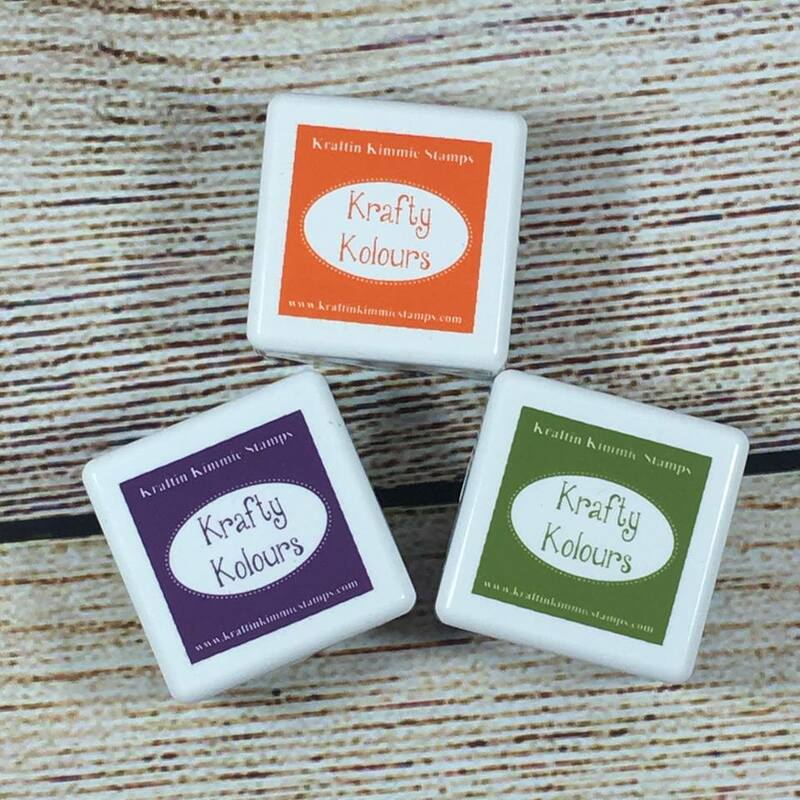 The gorgeous new Krafty Kolours Hybrid Inks we are introducing this month are Mossy Meadow, Pumpkin Patch and Purple Petunia!! You can get them in large ink pads, mini cubes and also refills!! They go perfectly with this release!! I stamped my image onto Neenah white cardstock with Wicked Black ink from Kraftin Kimmie Stamps. I decided to color my house all one color and try to keep a highlight on the right hand side where the moon is. I also colored a background around my house using copic markers. Then I took a rag and added some Colorless Blender. I went around my house and entire background just dabbing the area. The colorless blender removes ink and since I used a rag which has some texture to it, it left marks on the copic colored images. I love how this adds texture to my flat image. It kind of gives it that ol’ creepy Halloween feel. 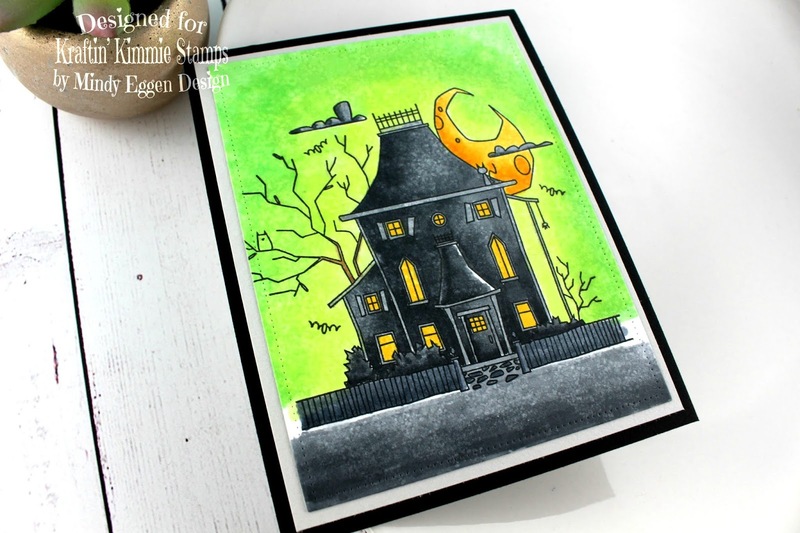 Check out this haunting set and new INKS in action as you hop around the Krafty blogs today! You’ll see the list of Krafty design team members PLUS special Krafty Guests below and be sure to leave some love at each stop because one lucky commenter is going to WIN a gift voucher to the krafty shop! Plus we’re doing a GIVEAWAY of the ENTIRE release on the Krafty Friends facebook page! We have a total of FIVE brand new clear sets PLUS TWO rubber rereleases AND THREE new Hybrid Inks being launched this week!You’ll get to see all the incredible creations for August as we share them each day this week! Be sure to join us at the LIVE Online Release Party on Saturday afternoon at 1pm EST! We’ll be checking out all FOUR new clear stamp sets, sharing fabulous creations, giving away prizes and having tons of krafty fun! This is just awesome!!! Love how dark the house is, and the texture! Wooo….love the colours….I just now noticed the kitty on the top of the house! Awesome card! Love how the background is glowing around the house. It really adds to the spooky feel. I love your coloring especially the contrast with black and green. Never would have thought of the green background but i love it! Thanks for the tips on the background!! It turned out awesome!! The green really makes the black house pop. The colouring looks great and the background really works with the Halloween House. I love the silhouette look on the bright green. Awesome card! Your background is amazing! EErie background color! Looks fabulous with the haunted house!